There are two sizes of The Nutribox, a standard box and a mini-box. The Standard Box contains 16-20 snacks and the Mini Box contains 8-10 snacks. 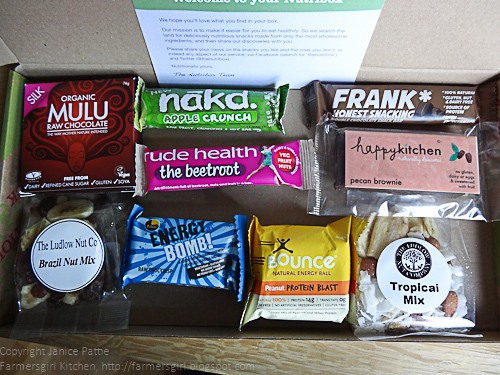 I received a mini box containing nine snacks. There are a range of options for subscriptions from a single monthly purchase to a six month subscription. More information about subscriptions is available on The Nutribox website read on to find out how you can get a discount on your first order. The snacks were well packed in the box with no damage or breakages. 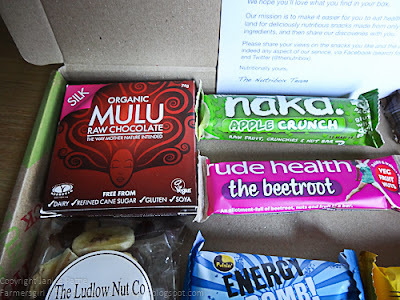 The only brand I recognised was Nakd, so it was quite exciting to see all these different healthy snacks that we would be tasting. I had to hold my husband back till I got some photographs taken! I was particulary excited to try the Mulu Raw Chocolate as I've heard about raw chocolate but never tasted it. I'm afraid I was not impressed, the taste of the chocolate is okay, but not a strong, dark chocolate taste that I would expect from the colour of the chocolate. What really put both me and my husband off was the texture, it was like cooking chocolate and there was none of the chocolate mouth feel that makes it...well chocolate. On the plus side, it's free from diary, refined cane sugar, gluten and soya. The Nakd Apple Crunch is gluten, wheat and dairy free. It's made up of dates, soya crunchies, cashews, raisins, apple, apple juice concentrate. It was a tasty furit bar, full of fruity flavour, I would recommend this snack bar. The Beetroot from Rude Health has no added salt, no refined sugars is a source of fibre, gluten free and non GM. This was a tasty little bar however, the 'beetroot' seems a bit superfluous and a gimmick as the bar is 69% Dates and 20% Almonds with only 7% ground beetroot. The Energy Bomb is a vegetarian, gluten free bar with no added sugar, no transfats and it is non GMO. I'm not sure I would choose this one again, it tasted a bit worthy and reminded me of some of the snacks I used to buy in 1970s Wholefood shops, filling though. The Bounce Natural Energy Ball in Peanut Protein Blast tastes very much like peanut butter, it's not oversweet but not one I would rush back to try. The Double Chocolate Snack Bar from Frank Honest Snacking is 100% natural, gluten, nut and diary free. It's 47.2% fruit, mainly dried dates, plums and fruit juice concentrates, it also contains coconut blossom sugar and coconut cream which gives it a lovely texture and a natural sweetness. A big hit in our house. The Happy Kitchen, Pecan Brownie was dense and very tasty indeed, I shared it with my friend and it got us through Friday afternoon! 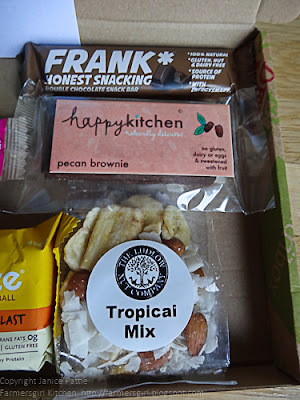 Tropical Mix - a handy packet size, an awful lot of coconut but it is a Tropical Mix, but I enjoyed the almonds and banana chips. 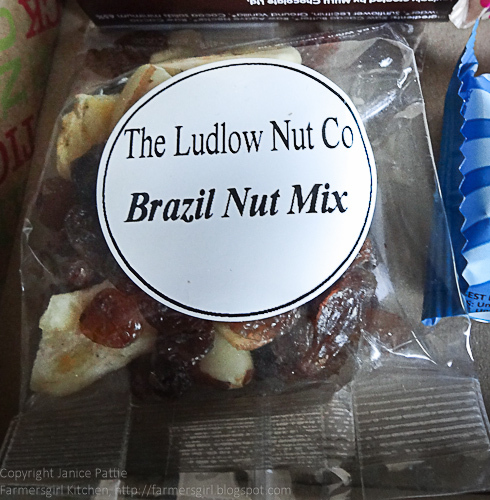 The Brazil Nut Mix was a similar handy sized packet to the Tropical Mix, I find if the pack is too large, I just keep eating! 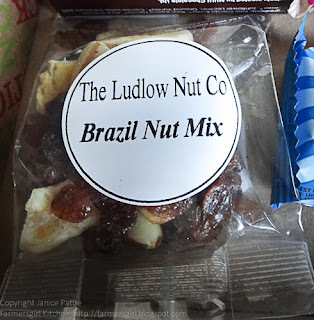 I'm not sure the name is very accurate, I had about 4 half Brazil Nuts, a lot of sultanas and banana chips. Very tasty though. Overall I would say The Nutribox is a good deal if you eat a lot of healthy snacks or would like to eat more of the healthy type of snacks. They are a nice size and there was a good variety. The first 10 Farmersgirl Kitchen readers to order a Nutribox will receive 35% off their first box which you can claim by entering FARMERSGIRL35 in the discount codes box on https://thenutribox.com/join. I am jealous of your pecan brownie, sounds lush! Really liked the box I had a few months back, am very tempted to become a regular customer! @Dom - yeah raw chocolate is a unique taste, I quite liked my bio-organic one but my boyfriend spat it out! !